Depending on where you are in the world, maybe the climate isn’t making you think of swimwear. But winter trips to tropical climates and upcoming spring break fashion needs will have you clamoring for the latest suits to let your customers set their kids on the beach in style. Move on from simple colors and basic one-pieces and dive into patterns and suits with designs intricate enough for ball gowns. 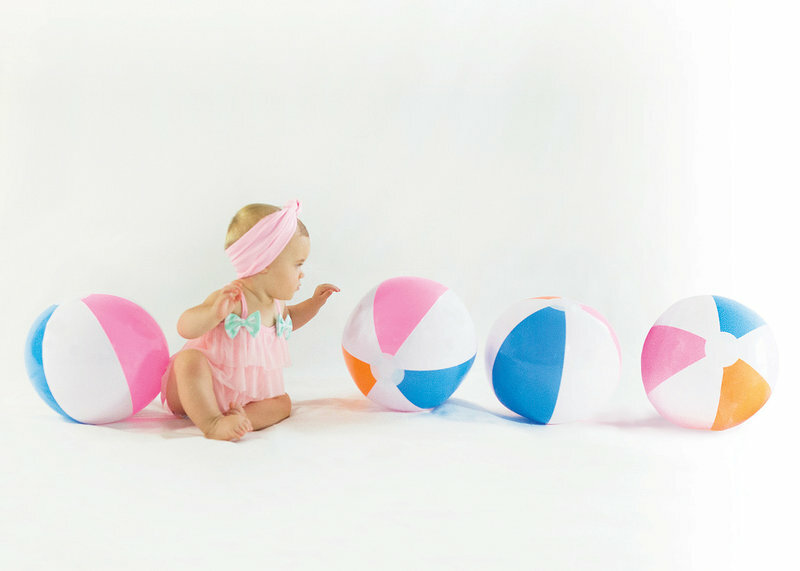 With dressy options from Froufrou & Company and Isobella & Chloe, plus practical sun protection from Little Red Fish and Platypus Australia, you are sure to assemble the collection that will please all your discerning buyers and make you the one-stop-shop before the beach. Imagine if kids could play dress-up in their swimwear! Froufrou & Co. is a new brand of babywear in California, specializing in high-quality and high-style clothes for the sweet little ladies of the world. Two sisters who grew up playing make-believe find fun in all things girly and bring that joy to their swimwear line. Froufrou & Co is designed for the unapologetic girly girl with a discerning eye for style and a sense of adventure as big as her sense of humor. The line is all about mixing and matching. Girls can make a splash in the Camille two-piece babykini with mixed prints and a large bow on the front. This adorable two-piece is an instant classic in colors like pink and purple and rose print with aqua stripes. For parents who prefer a one-piece, the Coco is full of ruffles and has sweet bows on the straps. 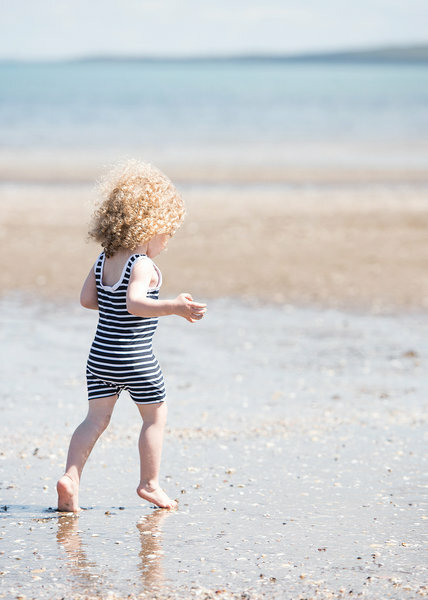 The navy one-piece has mint stripes inside for a beautiful contrast. The Emma is a pretty little suit that has the flair to make any girl smile. A dainty mesh ruffle on the waist and another on the top are accented with soft bows just ready to twirl. The purple with navy and white polka dot bows will make any display stand out. UV protective swimwear has grown beyond a niche and the demand for high-quality but stylish versions has grown. Little Red Fish was created more than ten years ago by two industry moms who saw the importance of UV protection early on. 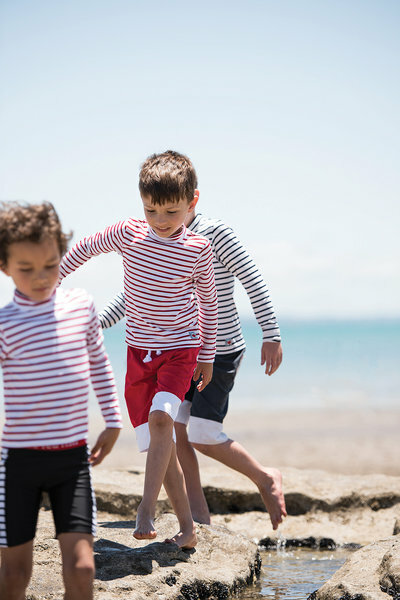 The focus of 2015 and 2016 is on nautical stripes. Little boys can make a big splash in the short-sleeve full suit in navy and white stripes. 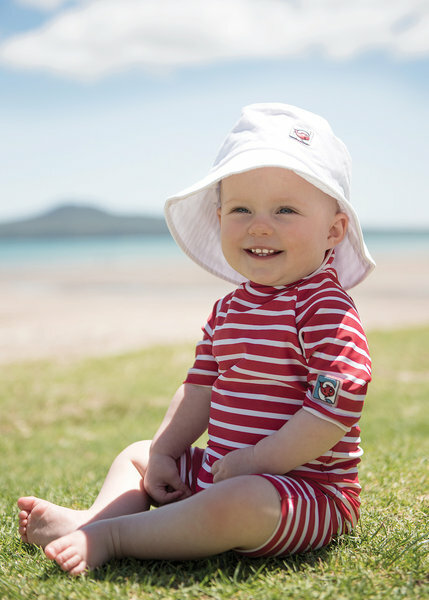 The close-fitting style keeps sand out of diapers and the easy zipper on the back makes changing a breeze. The Classic is an old-style bather with the combined tank top and shorts, in old-time colors of red and blue with white stripes. Boardshorts are relaxed fit with a drawstring and elastic waistband with light blue and white color blocking. For parents of young boys with small bottoms, the boys slim fit racer swim shorts will fit like a glove and fly off the shelves in a simple black that goes with anything. Hearts are also prominent in the current collection, The Classic Bather for girls is a trendy hot pink on the front with white hearts on the back against a black background. Producers of high quality, fashionable UV protective swimwear, Platypus Australia’s swimwear has been spotted on kids of celebrities like Jessica Alba. Platypus Australia’s swimwear ensures the wearer maximum sun protection, blocking out at least 97.5% of harmful ultraviolet radiation. 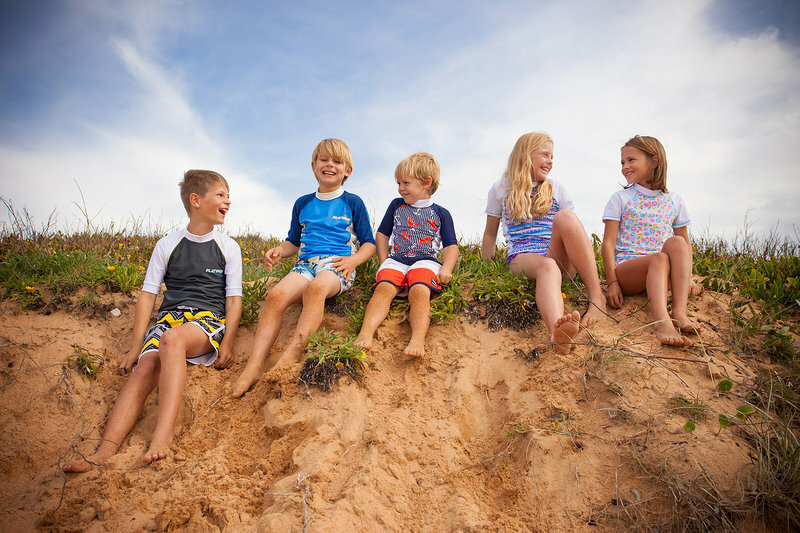 Designed to mix-and-match, the UV protective swimwear and rash guards are for kids who like to be active, comfortable, stylish and protected from the sun. Platypus Australia was formed in 1996 by two mothers who had first-hand experience with applying sunscreen lotion to kids-on-the-move! They realized that there was a demand for kids bathing suits and rash guard clothing that would protect children from the sun’s damaging rays and still be comfortable and cool. The UPF 50+ Tankini with Frill is cool to be sure. A stylish skirted little tankini bathing suit features a racerback and pattern mixing. The UPF 50+ Singlet Kini features pattern mixing with ruffles to add a of splash of style to this stunning suit that’s ready for fun in the sun. 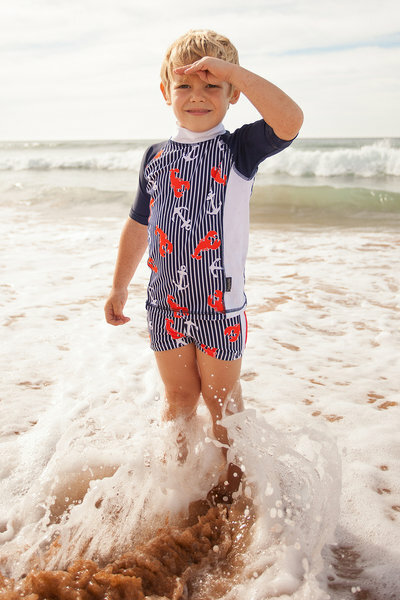 For little boys, the Life Buoy is a colorful collection of navy and aqua patterns in all the styles. 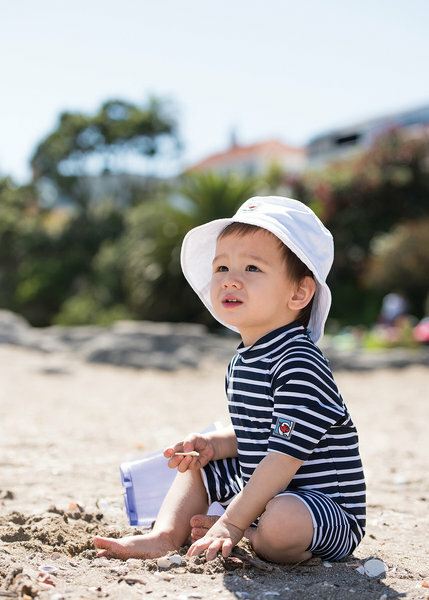 The Baby Sunsuit is one of the best to show off with an open front zipper with a protection flap and studs in the inseam for easy diaper changes. Classy and progressive, the entire line of clothing at Isobella & Chloe is adorable, but their swimwear is the standout. Featuring traditional cuts with modern color combinations, these suits are destined to be classics. The Bella Rose Tankini in pink has a trendy keyhole top with ruffle roses at the bottom. The bottoms are simple and full coverage, perfect to hide a diaper. The Sunburst Tankini is a whimsical combination of hot pink and orange with full ruffles. The Sun, Sand & Surf Bikini is great for older tweens, in animal print against a vibrant turquoise. The Summer Doll 1-Piece is classic pink gingham with delicate white and pink flowers along the straps. Little girls can live out their mermaid dreams with the Under the Sea Bikini in aqua with coral polka dots. The bottoms have two layers of ruffles that resemble a tutu with a big bow sure to dazzle any girly girl. In addition to the beautiful suits, you’ll find a wardrobe collection worthy of your biggest display at Isobella & Chloe. Sketched in Los Angeles and created by a seamstress in Vietnam, the goal is for their clothes to become keepsakes, having a long and magical life. Isobella & Chloe - Best of Chums Int'l Inc.